PHILIP A. HOLMES/Sun-Gazette Three people were injured Friday night when a Ford Explorer, at left, collided head-on with a Dodge Ram pickup truck, at right, on Northway Road Extension in Loyalsock Township. All three people involved were treated at a local hospital. Three people were hurt – including a man who suffered serious head injuries – in a violent two-vehicle head-on collision Friday night in the 1600 block of Northway Road Extension in Loyalsock Township, according to state police. 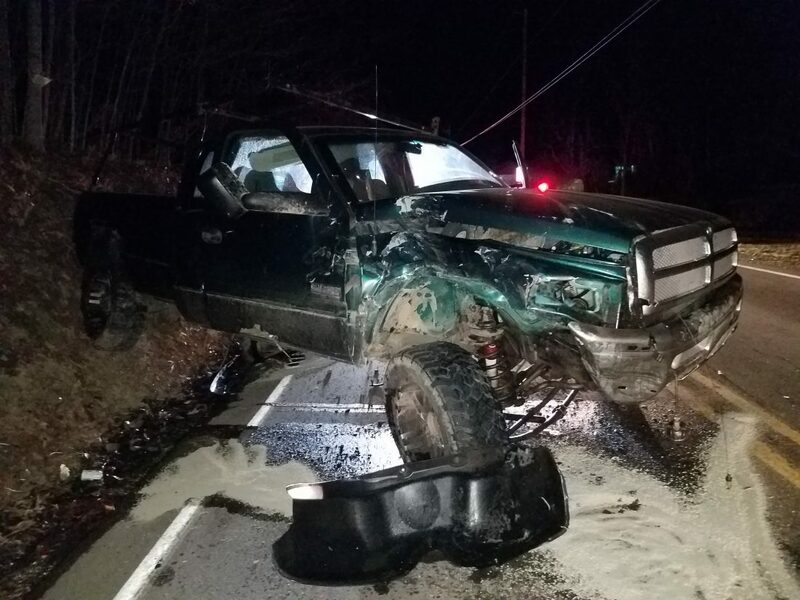 Andrew Watson, 31, of nearby Poco Farm Road, lost control of his 1999 Dodge Ram as he was traveling south in the 1600 block of Northway Road Extension about 7:20 p.m., police said. 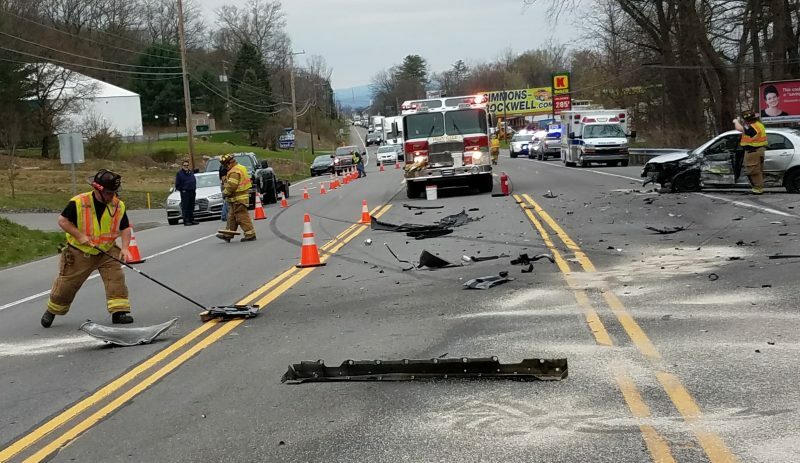 The driver failed to negotiate a left hand curve, went off the road, traveled back onto the road and into the northbound lane, colliding with a 2016 Ford Explorer driven by a 17-year-old Williamsport boy, police said. Both drivers and a 17-year-old girl riding in the Explorer were taken to UPMC Susquehanna Williamsport Regional Medical Center to be treated for their injuries. Police do not release the names of minors involved in crashes. daughter’s home on Northway Road Extension when she and other family members heard the crash. “We were in the house talking when all of a sudden we heard this screeching and crunching. We knew it was an accident. We all came flying out of house because a couple of children were playing in the front yard. Everyone (in the yard) was fine,” Jackson said. “It sounded like a massive crashing,” she added. A family member called 9-1-1. Jackson said she saw the driver of the truck walking down the two-lane road after he got out of the vehicle. He was bleeding extensively from his head and face, she said. The man turned around and headed back to his truck and then soon “he took off running into the woods,” she added. Debris from the mangled wreckage was strewn across the road. The crash occurred about 100 yards north of Poco Farm Road. The collision ruptured the truck’s fuel tank, spilling an estimated 40 gallons of diesel fuel onto the road. Firefighters used dirt from a nearby embankment as well as absorbent booms and pads to contain the fuel, preventing it from getting into a nearby stream. A state police accident reconstructionist along with representatives from the state Department of Environmental Protection, the state Department of Transportation and a Winfield-based hazardous materials clean-up team all responded to the crash that shut down a portion of the road for about five hours. In another weekend crash, Old Lycoming Township police and Hepburn Township volunteer firefighters responded to an accident in the 1700 block of Quaker Hill Road in Hepburn Township, where a car driven by Christopher Thomas, 24, of 3198 Northway Road, slammed into a tree about 4:20 p.m. Saturday.